Are you an Almond Joy person or do you prefer Mounds? Or, as a tragic option, do you eschew both, claiming that coconut is gritty and gross (I'm looking at you, Little Brother...)? I consider myself a Mounds gal, but that's only because the whole almonds in an Almond Joy are so bulky and incongruent--there's no way to get a bit of almond in each bite unless you a)shove the whole thing in your mouth, or b)pop off the almonds and take a bite of candy bar followed by a nibble of almond. Ridiculous. If slivered or sliced almonds were used instead, I'd be all over it. Take note, Hershey's! Having said all that, it's no surprise that I used sliced nuts in this Almond Joy-inspired cheesecake. Other magnificent components include a graham cracker crust riddled with coconut (which I consider a complete dessert in and of itself) and a creamy cake bedecked with chocolate chunks, toasted coconut, and a bit of coconut flavoring. I'll admit that I'm not too keen on the flavor of almonds, but I do love the crunch the slivers provide. The amount of nuts used in this recipe is just right and there's none of that icky almond extract to muck up the flavor. What a relief. A few days after I made this, I had a Zagnut candy bar for the first time. Zagnut, where have you been all my life? Why do you taste so good and have such an awesome name? Crunchy peanut butter + toasted coconut = amazing. Because of this discovery, I think my next cheesecake endeavor will involve a peanut buttery crust and a purely coconut filling. Oh, yeah. For crust: Preheat oven to 350°F. Wrap outside of 9-inch-diameter springform pan with 2 3/4-inch-high sides with foil. Finely grind cracker crumbs, coconut, almonds and sugar in processor. Add butter; process until moist crumbs form. Press mixture onto bottom and 1 inch up sides of pan. Bake crust until set and beginning to brown, about 12 minutes. Cool. Reduce oven temperature to 325°F. For filling: Using electric mixer, beat cream cheese and sugar in large bowl until smooth. Add eggs 1 at a time, beating just until blended after each addition. Mix in coconut and extract . Fold in almonds. Transfer filling to crust. Bake until cake is puffed and no longer moves when pan is shaken, about 1 hour 15 minutes. Cool completely on rack. Run small knife around sides of cake to loosen. Release pan sides. Sprinkle with garnishes before serving, if desired. That is an awesome recipe! I'd love to have some of that cheesecake right now, for lunch! mmmm, que delicia. ESto es fabuloso. I am a committed devotee to the church of coconut. And chocolate. Or peanut butter. I love it, you don't mess around! That's a novel recipe! I love nutty cheesy treat and this is exactly perfect for me! Ha! You could have been writing about me cause I'm not a fan of either candy bar. Coconut and me are not pals, though I have to say that this cheesecake is gorgeous. Yeah almond joys are weird with the full nut on top. Now a Zagnut, I love those, we find them in an old pharmacy near our home along with some other oldie but goodies. This cheesecake looks like a winner! Delicious! Anyway you slice it, its delicious. My husband will love you forever and ever for this one. I hate to say it, but I was never a big fan of either almond joy or mounds. But, in the form of a cheesecake, that would drastically change things. This looks fantastic, especially with almonds in each bite! Yumm... I'll take either one, although I prefer Mounds because it's covered in dark chocolate. Thanks for sharing this neat recipe. It reminds me of an almond joy cake recipe I have filed away somewhere. Never liked either, Grace. But in this form? Hmmmm. Changing my mind! Great photo! I have never had or seen a Zagnut bar - looks crazy amazing. Loving this Almond Joy cheesecake idea. Bet that went bye bye very quickly! Anything coconut is awesome in my book :) I have never had a Zagnut but I do love Chick o Sticks...sooooo tasty! I love both! Sometimes I feel like a nut, sometimes I don't (laugh). I have no doubt Zagnut would be delicious too. I have to say, I am a HUGE almond joy fan. HUGE. But...I'm the only one I know with quite this amount of passion for coconut. What is WRONG with everyone?!?!? This cheesecake sounds amazing to me! My dad would go nuts for this--pardon the pun! I'll take the mounds if almond joy isn't available. And I'll take this pie any time. I've never heard of Almond Joy or Mounds but I'm not much of a fan of whole almonds either =) This cheesecake sounds so good!! I love the sound of the crust, and I love that there's so much coconut in it!! i'll have a slice of candy, please! mmm, lookin' good! OK I admit it I am in the learning to like coconut category! The Walking Dead premiere is very scary but since then it is more just tense, like Lost or something. People banding together, dealing with disaster, etc. AND SO GOOD. I am an almond joy girl because dark chocolate is too rich for me. That is one killer looking cheesecake. Mmmm good! Zagnut is my all time favorite candy bar, and I'm finding them harder and harder to find. I guess that's good though because I eat too many of them when I do find them. :) That cheesecake looks delicious- I like both Almond Joy and Mounds, so I'm sure I'd love it! I've never had zagnuts. And don't quite care for mounds or almond joys. Weird I know. Michael will take all 3, I'm sure of it. The dessert you made looks amazing though! You said the magic word - coconut :) And I would love to try a zagnut, you're right even the name sounds fantastic! Actually, come to think of it, I would really like to try and Almond Joy or a MOunds too. Never mind, I can always make this cheesecake right Grace? I'm surprised that no one sang "sometimes you feel like a nut! sometimes you don't!.. almond joy's got nuts and... mounds don't..
Oh gosh--the Zagnut sounds crazy delicious. I don't think these still exist in the US, but my favorite bar is Bounty. Yummy coconut and chocolate! Not heard of the Zagnut before, but looks good, as does the cheesecake! This is a delicious treat, loving all the coconut and a chocolate drizzle! Fabulous recipe Grace, this looks wonderfully tasty. LOL I am not a huge coconut fan myself, but I would LOVE to eat this! I think I enjoy it more the older I get! OMG, a devilishly looking good candy bar I haven't heard of before? Good grief, I better start my hunt for a Zagnut. You have me hooked just from the photo. If only Hershey's made those bars with out the chocolate! Then I'd be all over 'em. :) Yes, I know weird but don't say too much you don't like almond extract! I have to admit, I don't like either. I subscribe to the icky gritty texture train of thought. Still...that cake is downright gorgeous! With the right coconut I know it could win me over. Happy Thanksgiving Grace, have a super week! Mounds has always been one of my favorite candy bars! I agree completely about the whole almond on top of the Almond Joy; maybe Hershey's will take note of the slivered almond idea! The cheesecake looks A MAY ZING!! And the Zagnut brings back childhood memories of the Chick o Stick. It used to be another fave of mine as a kid! That looks amazingly gorgeous and I bet it tastes even better. All candy bars are my friend! Sometimes you feel like a nut....sometimes you don't! LOL either way...I would take a slice! I've never tried any of these candy bars!! Your cake looks so delicious. My fiance doesn't like coconut either. weirdo. I have no problem popping the whole candy bar in my mouth. It just would not be right to pass up on coconut and chocolate! I'm coming across more and more people who don't like almond-flavour...it's something I don't understand. 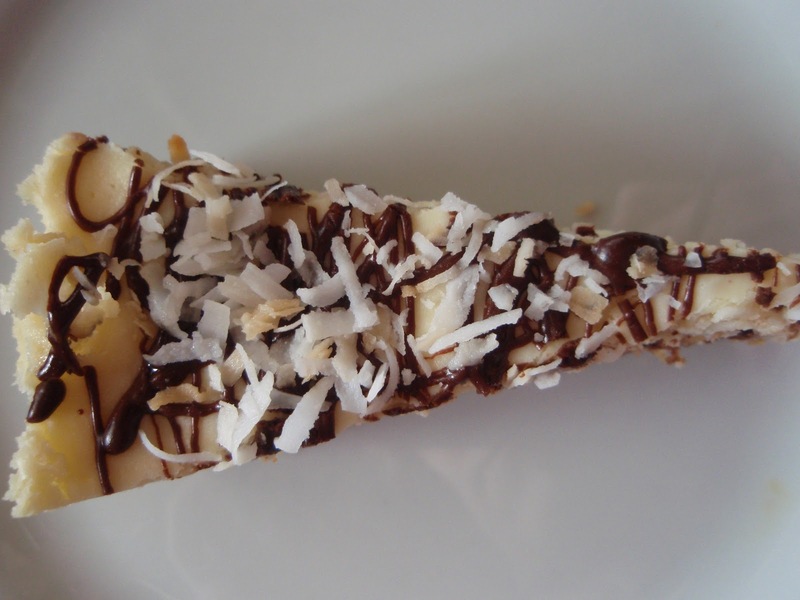 The combo of almond and coconut sounds amazing, and your photos are drool-worthy. Want! wow! another great mouth watering chocolate recipe! I so love it..! Mmm, what a lovely cheesecake and great idea to use almond slices! I wasn't a huge coconut fan when I was younger but I really like it now. I love almond joy! That was my favourite chocolate bar as a kid and I still crave for it today! Haven't had it in ages though... beautiful dessert you made. I have to admit, I am a Almond Joy fan both are great though! And this cake looks divine. Cheesecake? That's not like you! This looks wonderful.